ItemA-05955 - Fisgard Lighthouse, Esquimalt Harbour. ItemA-05958 - Group of naval officers, sailors and an unidentified woman aboard HMS Sparrowhawk. ItemA-05967 - The American military camp on San Juan Island. ItemG-00411 - "S.S Beaver 10 miles from Fort Simpson"; near Sumerville Island, Captain George Merchant in small boat second from left; sketched by officer on board. ItemA-01749 - Governor Frederick Seymour and pet cat; see also B-07224; this is original photo of the two. ItemA-00846 - HMS Zealous, flagship of Rear Admiral George Fowler Hastings, Commander in chief, Pacific Station, royal Navy, 1866 to 1869. ItemA-02815 - First Presbyterian Church, Victoria; Corner Of Pandora Avenue And Blanshard Street. ItemH-03194 - "St. Andrew's Church, Victoria, Vancouver Island". ItemF-08549 - Mrs. Frederick Seymour with her husband and his secretary. Item A-01749 - Governor Frederick Seymour and pet cat; see also B-07224; this is original photo of the two. 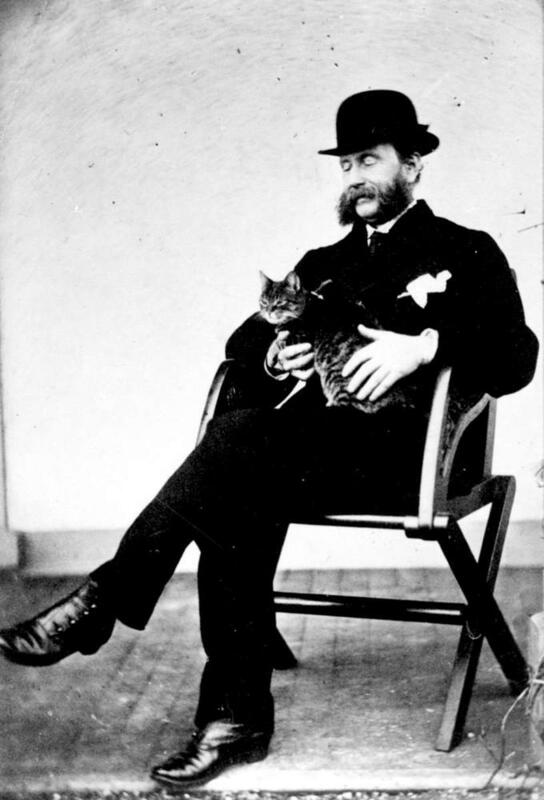 Governor Frederick Seymour and pet cat; see also B-07224; this is original photo of the two.